Working in a hazard-prone work site leaves you vulnerable to injuries, so wearing different types of protective gear should be a priority. Your feet, for instance, is made up of many bones, and although there are safety boots which protect the toes when accidents happen, some of them do not shield the mid-foot bones connected to your toes which are also called metatarsal bones. To prevent accidental fractures of your metatarsal bones when a heavy object falls on your feet, wear metatarsal boots which protect the top and sides of your feet against the impact of heavy blunt objects and power-driven cutting or firing tools. Convincing yourself that you need metatarsal or Met Guard boots becomes easier when you think of injuries you can get without them. Some people confirm that the external type gives more protection, while other people choose the internal type for its less bulky exterior and inbuilt met guard design . Whether you prefer the one or the other, it is important to know the top-rated metatarsal boots out there for each type not only for you to make an informed decision but also for your feet to come back home in the same condition as when they left. 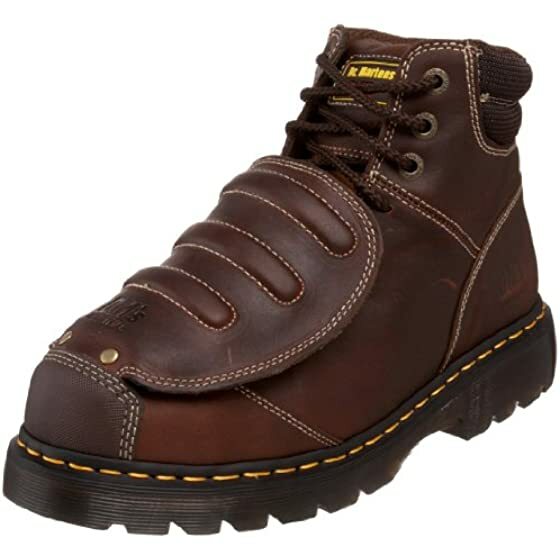 One of the most popular external Met Guard work boots is Dr. Martens Ironbridge, and with padded leather which envelopes the metatarsal guard, you do not have to worry about tripping over in the workplace even when wearing metatarsal boots. The boots are also designed with comfort in mind. The air-cushioned soles, moisture-wicking linings which reduce sweat and wetness, and water-resistant leather uppers are only some features that permit ease of walking. 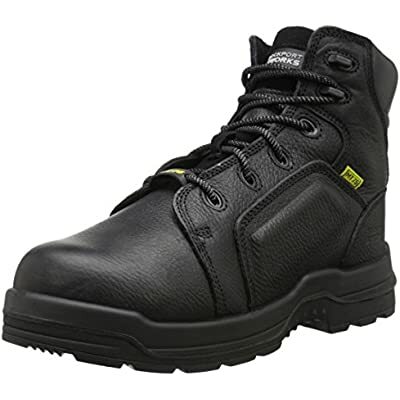 However comfortable the internal metatarsal boots feel, you have the guarantee that they are also designed to withstand tough working conditions. Aside from the metatarsal guards, the Ironbridge boots also include steel toes. Your feet have another layer of protection as the design of this Dr. Martens provides electrical hazard protection, not to mention the stability it offers due to the addition of standard wood shanks. The design of this tough boots leaves nothing to chance. The eyelets and lace carriers are made from heavy duty materials, the cord lacing offers industrial strength quality, and the uppers provide long-term durability due to double stitching technique. Your toes and the front and top of your feet stay protected with these very durable boots. Considered as guard dogs for your feet, the external work boots houses steel toe caps and metatarsal guards to keep your feet from harm’s way. Just like other high quality boots, the Golden Retriever 08942 meets the ASTM F2413-11 standard and comes equipped with electrical hazard defense. You get many durability and security features when you buy the boots. 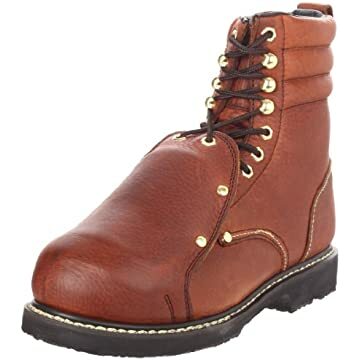 Aside from providing you with Goodyear welt construction with Kevlar thread technology, the boots also has outsoles that are oil-, slip-, high heat- and abrasion-resistant. The leather boots, although durable, does not fall short in the comfort department. You can keep your f﻿eet dry even in rough conditions with the Golden Retriever work boots’ moisture-wicking eco-friendly polyurethane insoles, which are coated with Aegis Microbe Shield to stop the growth of bacteria and fungi. Not too bad for a Met Guard boots which main selling point is safety. The stunning design of the Timberland’s Met Guard boots model is enough to catch your interest, and just by looking at the boots you know that it is comfortable to wear. The internal metatarsal boots offer a lightweight design and breathable and comfortable materials. For maximum comfort, the footbeds of the Pro 53530 boots of are made of contoured single-density and open cell breathable and comfortable materials. For maximum comfort, the footbeds of the Pro 53530 boots of are made of contoured single-density and open cell po﻿﻿﻿lyurethane material, while the rubber outsoles include very comfortable internal polyurethane. 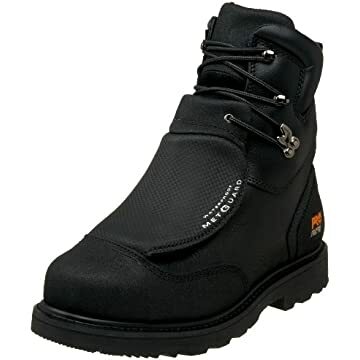 To secure and stabilize your feet as you move around a potentially hazardous work site, the Timberland boots features high-quality fiber thread on its uppers and welts, has cast metal top hooks, Cambrelle linings, and includes steel shanks to boot. 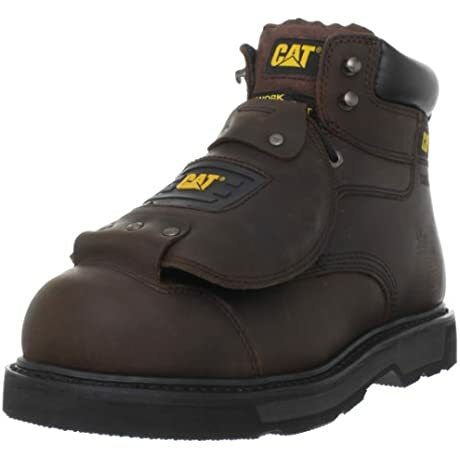 The rubber outsoles are slip-, oil- and abrasion-resistant to make the boots safer to wear at work. You can feel that metatarsal guard boots have definitely evolved from the stiff work boots of the olden days when you wear the boots as it incorporates thinner and more flexible materials. Caterpillar is a very popular brand that is known for the durability of its products. You can expect the same quality in its Men’s Assault metatarsal guard boots. You can work outdoors or in an extreme environment and still keep your feet cool and dry wearing the external metatarsal boots as it features Advanced ClimaSphere linings which wick off moisture. Aside from keeping your feet dry, the boots also shield your feet from chemicals and open circuits as its rubber outsoles are slip-, oil- and heat-resistant. The boots itself is rated for electrical hazard protection. In addition, the rubber outsoles have Goodyear ﻿welt sole construction as the attachment to give you years of durability. You can expect quality from its uppers as they are made of durable full-grain leather. Comfort is also a factor that makes the work boots worth your money. Aside from making your feet dry, the Caterpillar boots have Climasphere linings that keep your feet comfortable in different temperatures, and it has footbeds that serve not only as a cushion but also as a shock absorber. If your feet tire easily when wearing your old work boots, get yourself a new pair of Rocky Work Rk6465 to make every step more enjoyable. The shock absorbing features of the work boots come aplenty, from removable EVA cushions made of Adidas adiPrene which provide excellent heel traction and shock absorption to dual density PU midsoles for stability and support reinforcement. The work boots even feature rebounding forepart pads and absorbing heels to maximize shock absorption. Moving around in the work site becomes easier with the boots. When it comes to comfort, the each boot of Rk6465 provides a breathable mesh with moisture-wicking properties for dry feet and extra wide toe cap for more space. Having a composite toe cap, the boots is not only lightweight but is also less likely to set off any metal detectors. The internal metatarsal boots will give you more reasons to move at work.moisture-wicking properties for dry feet and extra wide toe cap for more space. Having a composite toe cap, the boots is not only lightweight but is also less likely to set off any metal detectors. The internal metatarsal boots will give you more reasons to move at work. With so many options for metatarsal work boots out there, and with you having to choose between an internal and external type of boots, it is easy to get lost in your search for the best work boots for your needs. Before making a purchase, the first consider safety and comfort before convenience and style. Just like other parts of your body, the bones of your feet are prone to damage from external factors, and it is your responsibility to take care of them. Investing in quality Met Guard boots gives your feet the defense, flexibility and comfort they need for a risk-free day at work.